"Our Newest Portable Alt Press Relief Cushion..."
It�s finally here: alternating pressure combined with a conventional pressure relief cushion. 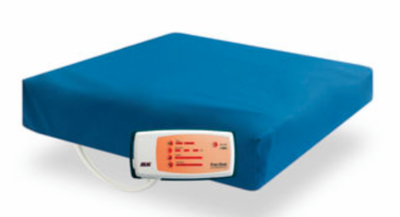 This medical air cushion has four alternating air bladders that provide the best possible pressure relief to heal and prevent bedsores � the perfect complement to an alternating pressure mattress when the patient is out of bed. This cushion decreases and disperses pressure over a wider surface area, stimulating capillary blood flow. Patented visco foam gel topper cools the cushion surface, maximizing the relief provided by the air redistribution. Fluid resistant stretch material is antimicrobial and fire retardant. 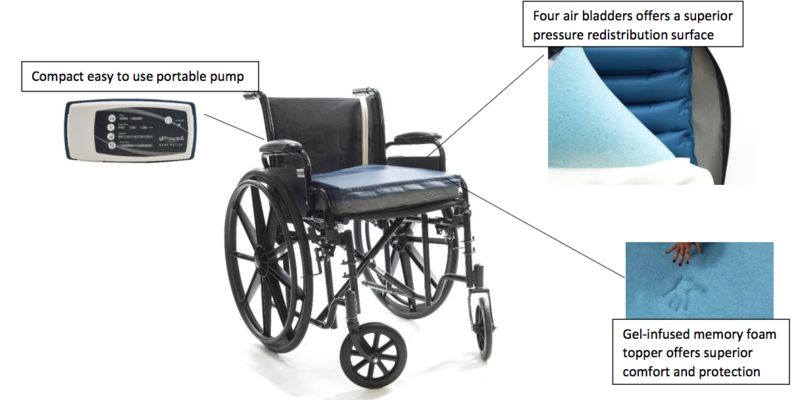 Non-skid bottom keeps the cushion in place and ensures proper patient positioning. Whisper-quiet pump features adjustable alternating pressure cycles, comfort control, and static float features. Includes seat cushion, pump with rechargeable 8-hour battery, and cover. Available in sizes 18x16, 16x16, and 20x16. Compact pump loaded with customizable features including alternating pressure, comfort control, adjustable alternating times, and static float. User friendly pump is rechargeable with 8 hours of continuous operation. Portable can be used anywhere, wheelchairs, cars, seats, chairs.